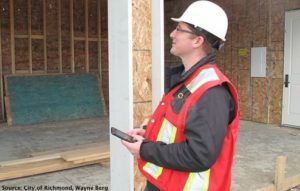 The City of Richmond was looking for a customizable mobile application for smartphones to increase the in-field efficiency of their building inspectors, and replace the two different approaches used by their inspectors of taking handwritten notes in the field, and having clerks enter them into the digital inspection management system at the end of the day or using the interactive voice response (IVR) system to update the results directly. The City of Richmond had a legacy backend workforce management solution already installed and in use throughout their internal operations that had a client interface unsuitable for field deployment because of expensive laptop, mobile data and secure remote access requirements. The City of Richmond had an internal development team who could develop APIs (Application Programing Interfaces) into the legacy backend workforce management solution. The City of Richmond purchased 14 Oranges’ Metro Grove mobile-first workforce management service as a bridge to link their custom APIs to the backend and enable the field inspectors to collect, store and print the inspection information through a smartphone app with a secure and simplified user interface (UI) in the field. The Metro Grove service deployment was done with the goal of increasing the productivity of the building inspection process, and allow the City of Richmond’s IT department the flexibility to adapt the service to improve the efficiency of other field service teams across the city. By eliminating the requirements to maintain two legacy inspection input systems and reclaim the time redundantly occupied by clerks retyping field workers notes, a rapid return on investment was expected from the deployment. The City of Richmond has a legacy backend workforce management system installed, and was paying to maintain two different input mechanisms for inspectors to post and report on the inspections they had performed in the field. In an attempt to unify the process, inspectors trial tested the use of ruggedized laptops, running the same client the clerks used to input results into the legacy inspection management system. The trial required cellular data cards and secure access to access the internal system. The UI of the client and was very complicated to understand, whereas the actual requirements of the inspector was to set a simple pass/fail flag on an inspection, along with comments, and print out the result on an in-car printer for posting at the inspection site. 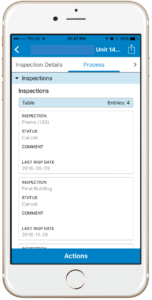 Given that supervisors and inspectors all carried current Apple or Android smartphones it was clear that there would be both a cost savings, and a productivity benefit to be gained by having a simple, secure smartphone client that inspectors could easily take onto a site and perform the same inspection in both online and offline scenarios. The legacy backend workforce management system did not offer an open API to support a smartphone app, however the City of Richmond had development resources on staff who could develop and API into the legacy backend system. That in-house development capability made it possible to create a connection to a custom mobile app, or a 3rd party mobile application service that could provide a mobile app for the field inspectors. A discussion then ensued about the development of a custom mobile app, or the use of a 3rd party mobile application service to deploy and manage the mobile app on behalf of the city. A 3rd party mobile application service offered the advantage that it had a lower initial cost to develop, and the maintenance of the application was taken care of with a low annual subscription fee relative to having to code and maintain an app across the Android and Apple smartphones in-house, or with a custom app development vendor. The 3rd party mobile application service would therefore be required to integrate with the API developed by the city, and should be able to present customizable forms on a wide range of smartphones. The city would further benefit if mobile application service could also be customized by the IT department for other departments with field workers, and for integration into one or more back-end systems used by different departments in the city. In addition, the 3rd party mobile application service would also be required to support an authenticated single sign on access method that allowed users to use their current system credentials to access the mobile application and perform the inspection. The City of Richmond decided to deploy 14 Oranges’ Metro Grove service as it met and exceeded their requirements. By decoupling the frontend field inspector UI from the backend systems, the Metro Grove service offers the potential of upgrading, extending the life or replacing the backend system without impacting the day to day routine of their field workers. 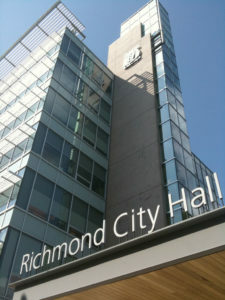 The City of Richmond anticipates an rapid return on investment (ROI) on the service every year, including the year it is put into service, based on the productivity benefit stemming from a simplified interface on a smartphone and the cost reduction against the equipment, staff and services previously required to support the legacy system input client. The City of Richmond expects to extend these benefits to support the field worker requirements of other departments against the same backend system or other specialized backend systems to drive similar efficiencies across all the cities mobile workforces.